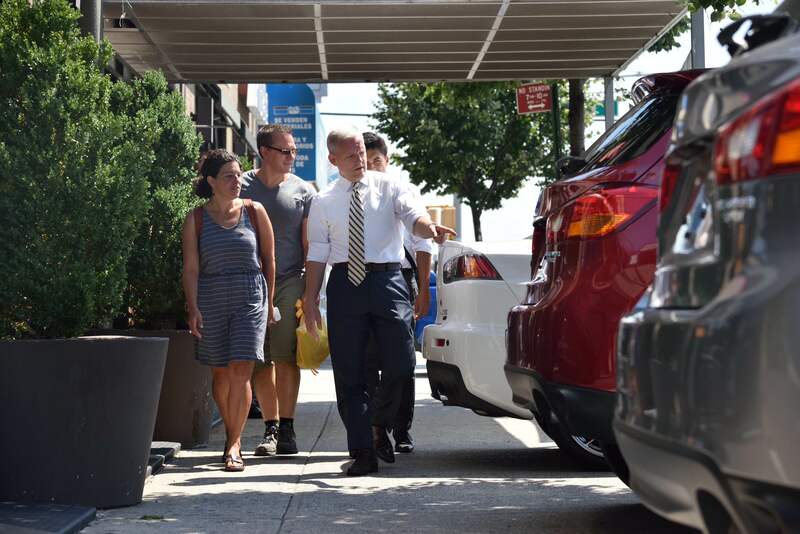 Walking the car-clogged sidewalks of Northern Boulevard this morning with street safety advocates and press in tow, Council Member Jimmy Van Bramer called on two NYPD precincts to crack down on auto dealerships that treat pedestrian space as car showrooms. Cristina Furlong of Make Queens Safer said representatives of a Honda dealership told her there was an exception in state law that allows car dealerships to park on sidewalks. The claim appears to be a complete fiction, and police occasionally do ticket the dealers for appropriating sidewalk space. Van Bramer said his office has reached out to many of the dealerships, and met with the 108th and 114th precincts yesterday about the issue. While the precincts have done some enforcement blitzes in the past, the dealerships remain defiant. The problem is worse on the weekends, when dealers put out even more display cars on the sidewalks. The question is “How much are members of the NYPD being paid off to ignore this problem instead of issuing tickets and calling the tow trucks? I does start with the precincts Capital and ends with the Police Commissioner. Has anyone asked the city to just install bollards? Given that there’s virtually zero prospect of this problem being enforced enough for it to go away, that would seem like the answer. In fact, this should be standard city policy anywhere there’s a problem with parked vehicles blocking sidewalks. That includes police stations. No. What I am saying is not that yours is a bad idea but a lament for the alleged New York of old which prided itself on straight talk and directness, not running halfway across the world to tattle. And if they don’t shape up, see if the cars are rockproof. Fact of urban life: Car dealerships don't care about anyone but car buyers.